While Cumbria has many positive attributes, it also features great inequality. The very factors which make Cumbria such a desirable tourist location and a visual treat affect just about every aspect of life here. For every show of affluence for which places in some Lake District towns are known, there are clusters of individuals and families living in poverty. 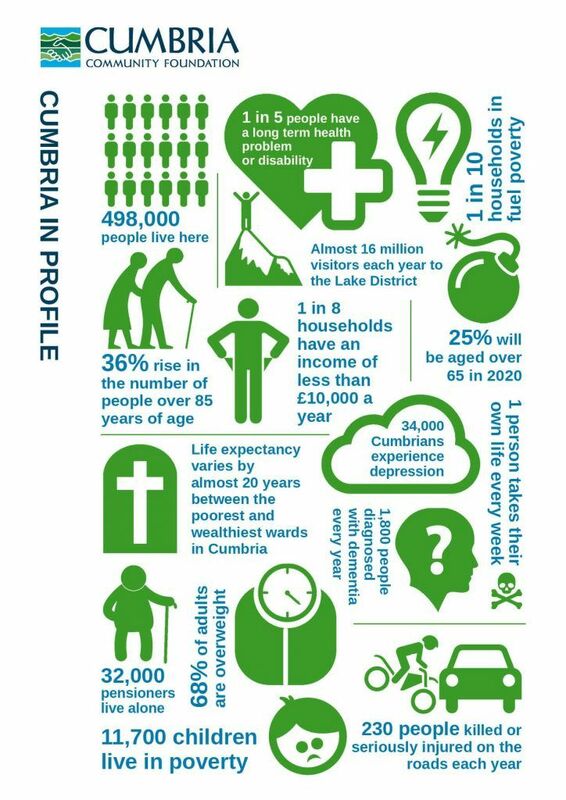 Our new report Cumbria Revealed explores the hidden social problems in the county and the effect they have on the social fabric and cohesion of our community. This report sets about uncovering those areas and themes where pockets of deprivation can be found, and where communities are struggling. We have gathered together information from many sources, which allow us to compare the picture in Cumbria with the rest of England. We are all very fortunate to live in and be part of this magnificent county. We have much to celebrate, however, as the report sets out, life is far from easy for many people. Within our outwardly appearing comfortable county, too many people are facing real poverty and disadvantage. The report also sets out the key issues in our communities and provides an evidence base to tackle poverty and disadvantage, and to guide philanthropy in the coming years. View the full report or contact us to request a printed copy.